The most established Organisations acknowledge that they can only thrive in a fast- paces and highly competitive environment by focusing and directing energy on their core functions. Research also proves that leading organisations use the Outsourcing Model as a mechanism to minimise cost and gain access to the best practices and competencies. 1. 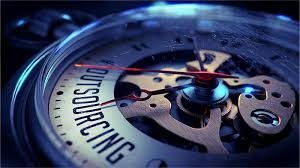 )PEOPLE OUTSOURCING: This is formulated on a unique Human Resource Model to deliver a smooth, cost effective and custom fit Outsourcing Solutions to our Clients. 2. )TASK OUTSOURCING: We cater to businesses and individuals who engage in routines activities that need to be outsourced for more effective and sustainable evaluation & execution. 3. )PROJECT & BUSINESS PROCESS OUTSOURCING: This unite partners closely with Clients to come up with innovations and interventions to produce their desired outcomes as an organisation.